Wondering what those symptoms could mean? The word is out that we aren’t getting enough vitamins and minerals anymore. People are tending to eat less fresh fruit and vegetables but even if you are, our soil is pretty deficient. What does that mean? The soil (and anything grown in it) can’t supply our body with everything it needs like it used to. 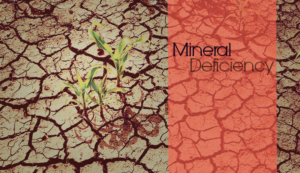 How do we know if we are deficient in minerals? According to Lydia Joy Shatney, a certified Nutritional Therapy Practitioner, there are a few signs to look out for. This list is just a snippet of what could be showing up for you as a signal that there is something your body is asking for. Taking antacids, having low stomach acid, using cortisone, pharmaceutical drugs, birth control, drinking coffee, alcohol, soda, consuming sugar, high levels of insulin or estrogen, and many more potential actions can also affect our vitamin and mineral levels. How are we deficient, anyway? Why is it important to discover which minerals our bodies need? First, we need to recognize why we are deficient in the first place. Let’s remember that we are made of earth! Our bodies contain the same chemical elements found in soil (Shatney, 2013). As mentioned earlier, because our soil is depleted, the crops it produces also lack the minerals we need which means they also lack vitamins! Did you know that minerals are catalysts to vitamins in the body? Taking supplemental minerals isn’t the only factor in replenishing our supply though. We need to make sure we are actually absorbing them as well! Taking a look at your gut health would be another important factor to take into consideration. Otherwise, buying supplements (make sure to choose ones that are bioavailable and formulated to stay potent) would be irrelevant because your body would just flush them out. That would be like pouring yourself a glass of water (expensive water, albeit) into a cup with a bunch of holes in it. Working with a professional to help get your levels tested and set up a plan to rebalance your body, as well as make sure you are absorbing the nutrients is recommended. We do have a few favorites that help us feel the deep earth boost right away though!